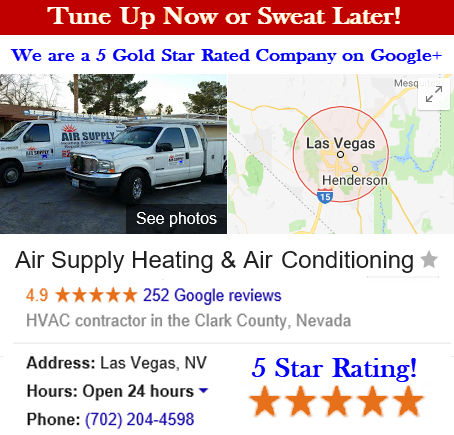 Air Supply Heating and Air Conditioning is full service HVAC system contractor, committed to helping commercial and residential property owners in the Greater Las Vegas, Nevada area with the indoor air quality, extreme comfort, and quality as well as energy efficient systems. 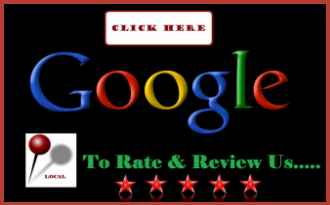 We are completely licensed, certified, and insured to provide the community with a phenomenal experience at affordable prices. 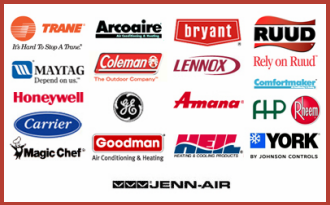 Air Supply Heating and Air Conditioning technicians bring their professional expertise and state-of-the-art equipment and products to every project we hired to perform; ensuring superior workmanship. 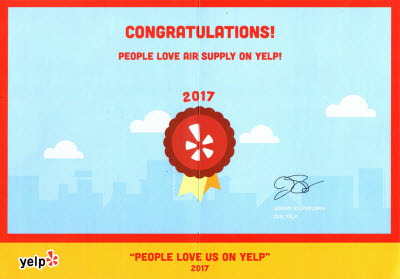 With Air Supply Heating and Air Conditioning you will not only receive have the service completed with remarkable quality, but you will experience family-friendly customer service, high morals, traditional values, and exceptional work ethics that all contribute to why you always contact Air Supply Heating and Air Conditioning for all of your HVAC needs. Air Supply Heating and Air Conditioning understands the various components to your Central Air System, including the air handling unit found in commercial and residential systems across the Las Vegas, Nevada Valley. The air handler unit is responsible for moving the air completely through the building. Conditioned air is useless if it can’t get circulated throughout the structure, and the heating and cooling system provides the temperature moderation. With the air handler, the temperatures are distributed throughout the building for even comfort. Housing the blower, along with relevant heating and cooling element, the air handler is the unit found indoors. In order for the air to reach the different rooms within the building, the air handler unit is connected to the ductwork. An extremely important application to ensure the system’s performance is the air filter and the maintenance involved with it. The air filter prevents dirt and debris from contaminating the quality of the indoor air quality. How Long Air Handlers Last? Both the heating and cooling equipment are coordinated by the air handler; whether the furnace and air conditioner offers the comfort or your Las Vegas, Nevada home or business is equipped with the split system heat pump. Residential and commercial air handling equipment is aesthetically installed within the wall; the access panel offering easy accessibility for maintenance and the only visibility or completely exposed but installed in the basement or garage. Air handlers are designed to last 10-20 years, depending on a few key factors; manufacturing quality, appliance of routine maintenance, and the extensive use of heating and cooling activities during the year all play a role in the longevity. A replacement air handler might be if it is older and experiencing frequent repairs, complete system failure, or if you to upgrade the unit to achieve maximum comfort and efficiency levels. When it comes to a split system and the failure of one of the indoor or outdoor air handler’s fall, some homeowners presume the replacement of the one failed unit is adequate, however, system components are designed to work in harmony and to ensure optimal efficiency, both units should be replaced. In some cases, if the air handler is experiencing faulty performance, Air Supply Heating and Air Conditioning can make the necessary repairs. If the air handler in your Las Vegas, Nevada home or business is in need replacement, or repairs, contact Air Supply Heating and Air Conditioning and let our experts do the rest.